Many disorders affect people on a daily basis. From walking and driving to things we take for granted, like eating and entertaining ourselves, people with disabilities face challenges every day. An infrared-sensitive video camera, mounted beneath the system’s screen, takes 50 pictures per second of the user’s eye. A low-power infrared light emitting diode (LED), mounted in the center of the camera’s lens, illuminates the eye. The LED reflects a small bit of light off the surface of the eye’s cornea. The light also shines through the pupil and reflects off of the retina, the back surface of the eye, and causes the pupil to appear bright. The bright-pupil effect enhances the camera’s image of the pupil so the system’s image processing functions can accurately locate the center of the pupil. Children and adults with MD, SMA, and Werdnig-Hoffman can benefit from the ease of positioning of the Eyegaze Edge. 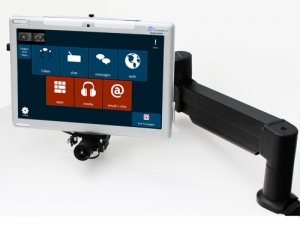 Because the Eyegaze Edge works accurately in any position, users with these diseases find it very comfortable to use. Children with SMA as young as 15 months are able to use the Eyegaze Edge effectively. Quadriplegia resulting from spinal cord injury is another disability that can be aided by the Eyegaze Edge. The system is often an excellent tool for people who are ventilator-dependent and quadriplegic, especially if they are non-verbal. It is also being used by some people with spinal cord injuries who are verbal, or who are able to move their heads, but find direct-selection with the eyes a faster and easier method of computer access than alternative methods of row/column scanning, voice control, or mouth or unicorn sticks. Many children and adults with cerebral palsy are currently using Eyegaze Edge systems to participate in school, from kindergarten through college, and in the workplace. Because controlling the eyes does not elicit a movement response in the body, many people with CP are proficient Eyegaze users. The eyes are a part of the brain, and controlling them does not cause movement in other parts of the body once the user becomes relaxed. In future blog posts, we’ll present additional disabilities that can be aided by the Eyegaze Edge. Our team is always happy to hear about success stories from Eyegaze users, so if you have one, please share in the comments section.